I was delighted to be back on the road visiting a few sites in the Wexford area. My intention was to view a couple of tower houses; but on my way from Mulrankin Castle to Ballyhealy I passed by this large standing stone. 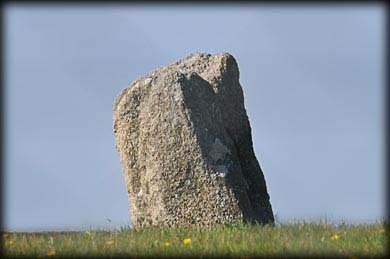 The conglomerate quartz-bearing stone is situated on a low hill and is orientated N-S. It stands 1.65 metres high and 1 metre wide. The field in which the stone stands is surrounded by a high fence, it appears to be part of a stud farm known as 'The Paddocks' Fortunately I was able to take these images from the roadside. Situated: Heading south on the N25 turn right on to the R736 at Tagoat. Stay on the R736 for 5.1 kilometres. You should see the entrance to the Paddocks on your right. 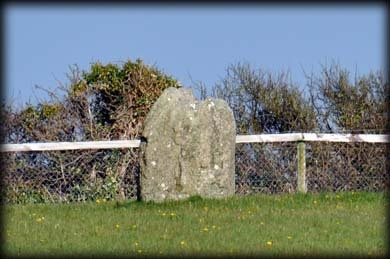 The stone is in the field to the east. Discovery Map 77: T 0606 0938. Last visit April 2016.